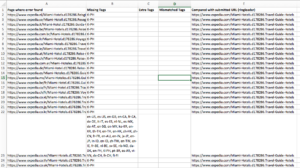 This worksheet contains a list of all URLs submitted for testing, and (almost) all Hreflang links found on those URLs. There is no information about which pages have problems and which ones are implemented correctly. Say your website is primarily in English and translations are available in German, French, Spanish, Portuguese, Italian and Arabic. 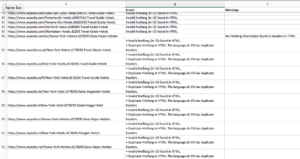 You submit your English sitemap for analysis to Hreflang.org. All your English URLs will be listed in Column A. Column B contains the self-reported language(+region/script) code for that page. So if http://www.example.com/page1.html includes an hreflang link pointing to itself (which it should), and that link specifies hreflang=”en” then we understand that this page is in English. So “en” is what you will find in Column B. If the page does not self-reference itself in its Hreflang tags, Column B will remain blank. Columns C, D and so on are for URLs that contain different language versions of the main (submitted) URL listed in Column A. So in our example, you will have columns for ar, de, es, fr, it, and pt. They are arranged alphabetically by language code. 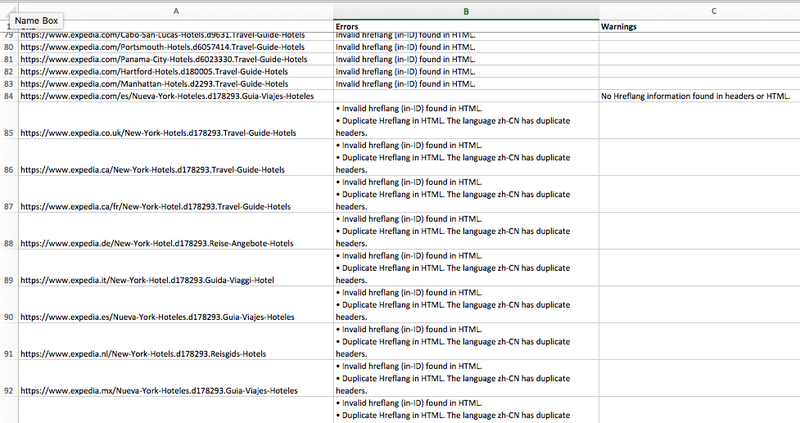 The Hreflang-Map worksheet in the Excel file. Click image to view full-size picture. The most common Hreflang implementation error is the “No Return Tag Found” error, and it can be a bear to troubleshoot. This worksheet will help make that much easier. The correct way to implement Hreflang tags is to use the same set of tags on all pages that have the same content. I like to use the terms ring, ringleader and ringmember to conceptualize this. Ring: A set of pages that have the same content, but in different languages. These pages are supposed to link to each other (and themselves) using hreflang tags. Ringleader: One member of the ring that was submitted by the user for testing. 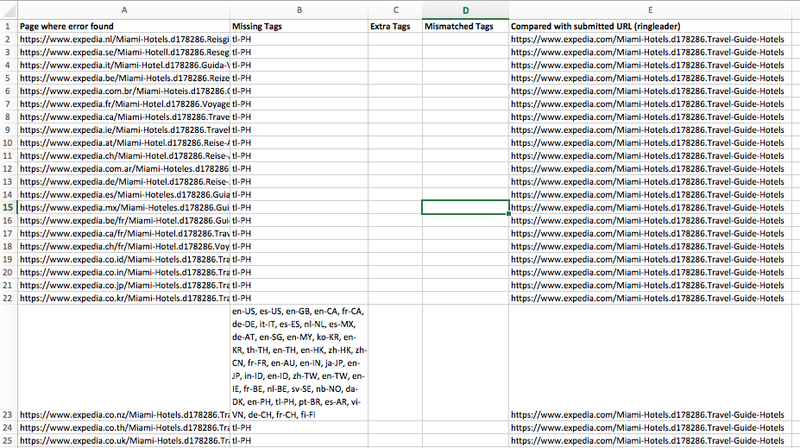 The tool finds other ring-members by looking at the Hreflang tags found on the ringleader. Ringmembers: All pages found in the Hreflang s of the ringleader. They must also be all crawled and verified. Missing Tags: Some tags found on the ringleader may be missing on the ringmember page. Extra Tags: Some tags found on the ringmember page may be missing on the ringleader page. Mismatched Tags: When the language code matches (say hreflang=”it”) but the ringleader points to a different page than the ringmember for the same language code. The Return-Tag-Errors worksheet lists all such errors for all ringmembers, along with the URL of the ringleader that was used to compare. The Return-Tag-Errors worksheet in the Excel file. Click for full size image. This is probably the easiest sheet to understand. All errors and warnings found on all pages are listed here. Pages without warnings or errors are not included. If there are >1 errors, they are listed as bullet points. But you’ll have to format Column B (select the whole Column by clicking on the column header (B), then click Wrap Text) to see all the bullet points in new lines. The All-Other-Errors worksheet in the Excel file lists all other errors and warnings for all URLs crawled during the test. Click image for full-size picture.